There are roughly 14.8 billion ears worldwide. Every ear - even your left from your right - is unique, special, and different. Just last year, the World Health Organization (WHO) reported that 1.1 billion teenagers and young adults are at risk of hearing loss. And it’s estimated that 15% of the world’s population already has some degree of hearing loss. That’s 1 in 7 people! A lack of hearing health awareness represents an enormous burden for people around the globe, though it disproportionately affects those in low and middle income areas. Adapted from data in: Stevens, Gretchen, et al. 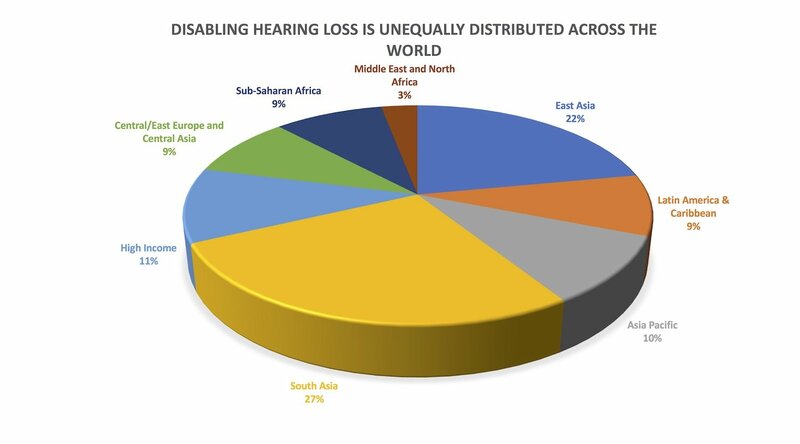 "Global and regional hearing impairment prevalence: an analysis of 42 studies in 29 countries." The European Journal of Public Health 23.1 (2013): 146-152. The cost of hearing loss is estimated at hundreds of billions of dollars each year in decreased productivity, unrealized tax revenue, and expensive disability services. People living in developing countries represent a significant number of those affected, with hazardous working conditions and limited access to general health care getting in the way of the most basic methods of prevention. And in many instances, social and cultural stigmas keep affected individuals from both seeking and receiving the help they need. #HereTogether is a movement aimed at bringing hearing health to the forefront of a global conversation. As technology, accessibility, attitudes, and culture have evolved, innovation in hearing health and the perception around assistive hearing technologies have remained painfully stagnant. The world cannot ignore this any longer, and it’s time to recognize the far reach of hearing disabilities, beyond the aging population. Global Citizens: join the campaign to spread awareness about the importance of hearing health. We cannot stand by and let our communities suffer financially and socially any longer.